It feels good to be going into this last and final attempt feeling okay - feeling sure - feeling a sense of acceptance that whatever happens is what was meant to happen. I really meant it! I typed that blog post after walking around for days with a puffed up chest. So proud of myself for having gotten to that place. Surprised that I felt so peaceful about walking away from trying to conceive should this round with an egg donor not work out. I guess I did lie to you about one thing. How the embryo transfer actually went. It did not go well. At least from my perspective. For months I was preparing myself. The meds were preparing me physically...and with the help of Dr. Trish and my acupuncturist, Dr. Kang, I was getting prepared mentally and emotionally. I needed to have a peace about me. It was so important to me that everything be in harmony before I accepted that embryo. I wanted this little baby to feel welcome and want to stay. But something happened immediately before the transfer that got me extremely upset emotionally. It's not important what it was (so don't ask), but I fell into hysterics and couldn't calm myself down. I almost had a panic attack. Also, something my doctor said made things worse. I've been taking Estrogen supplements to prepare for this embryo. He mentioned something about an "Estrogen high" and when I come down from that I may have regrets about only choosing to fertilize and transfer one egg. What? I'm on an "estrogen high?" Does that mean my decision may have been clouded? Does that mean my "confidence" about being done and walking away was because of this false sense of happiness and contentment due to high amounts of Estrogen??? I was so confused...and so upset...and so anxious from that moment on. When I tell you I sobbed during the entire transfer - I mean I covered my face to shield everyone from the *ugly cry* and worried that my shaking body might dislodge the newly placed embryo. I wasn't able to watch it on the ultrasound machine like I wanted. I couldn't even talk to the doctor afterward. Truth be told, I cried and had major anxiety for the two days I was on bedrest. Because of that - I convinced myself that there was no way that this could have worked. All of the ways I planned to be? Happy...joyous...content. Repeating my mantra, "Not my will, but thy will be done." Having zero anxiety or any negative feelings for fear of affecting the embryo. It was all out the window. I feel cheated - and I feel like I cheated that little embryo of a good start...or even a chance at all. 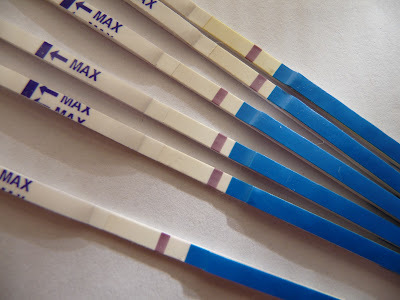 The earliest that I ever got a positive home pregnancy test was eight days after ovulation - and that was Brian's natural conception. So, with that knowledge - I started testing three days after my embryo transfer. Early? Yes. But my transfer was five days after the egg was fertilized. Which means that it translates to eight days after "ovulation". One day sooner than the pregnancy test box tells you they can catch it - but if you're pregnant, it will show up. So who cares that I tested then? I don't really know why anyone cared. Today? I am eleven days past a five day transfer. That translates to sixteen days past ovulation. I continue to get negative tests. The worst is how you feel during this time. I'm still on copious amounts of Estrogen. And I'm also on Progesterone. Progesterone not only mimics pregnancy symptoms...but it also keeps you from getting your period. Of course when you're anxious to know if you're pregnant or not you obsess over every sign and symptom. Tender breasts, fatigue, hunger, etc. But they all could be caused by the progesterone. And then when you start feeling pre-menstrual symptoms - you don't know if it's really that because the progesterone keeps you from bleeding! It's a mind tease. There have been a few tests (like today) where I swore I saw a shadow of a line. But I'm not optimistic. In my experience, if the shadow really is a positive - at this late date - it could be a chemical pregnancy. Or a beta level so low that it can only go down. I, of course, have scoured the internet looking for hope. Searching for stories where women went in with a shoebox filled with negative pregnancy tests and came out with a positive blood test. Or women who woke up the morning of their beta blood test and FINALLY got their positive home pregnancy test. They would be categorized under "stranger things have happened" with a sub-category of "But not to Kate." Do you know that I've composed my thank you letter to our anonymous donor already? I wrote it before the transfer. And on the day of her egg retrieval, we had the nurses present her with a bouquet of Sunflowers as a thank you for all she was enduring (egg retrieval is an uncomfortable process!). That is how sure I was that I was going to get pregnant. She's so young. The embryo was their "gold standard," they said. I had no reason to think it wouldn't work - I put so much preparation into accepting this embryo and helping it to implant and grow. If I'm right - and I'm not pregnant - I will feel like a complete failure. I just couldn't pull myself together and I'm hating myself for that. I feel like this perfect gift that was handed to us got all screwed up. And if this is going to end as I suspect - I just feel like I'd be failing Gavin and Brian. I so wanted them to have another sibling (especially Brian). I've been very depressed the last two weeks. Yesterday, Father's Day without my Dad, was one of the hardest days in a while. I thought I would be SO okay if this didn't work. But now, on the eve of my blood test, I'm panicked. I'm so afraid of a breakdown when they call me with the news. Suddenly I feel devastated that this dream of a third child is coming to an end. Partly because I wouldn't be pregnant. But also because it wasn't supposed to end this way. At all. I'm not kidding you when I say I'm rather fragile at the moment. And I'm not ashamed to admit it either - unless you have walked my journey, you'd have no idea how this feels. If you have a nasty comment...or a need to lecture me...or say anything remotely mean, cruel, patronizing, preachy or rude, it will hurt me deeply. Please...just say no to bullying me about this. And please - please do not tell me (for the eight thousandth time) to consider adoption. You're not privy to decisions and discussions and reasons within our four walls. I will get my results sometime tomorrow in the afternoon. And I will definitely post them as soon as I can. Many prayers are being sent your way Kate...for strength to endure the next hours of waiting, and for whatever the results may be! Obviously I am praying for a positive blood test tomorrow but if its not I pray that you find the strength to get through that! Your honesty and openess about this whole process is truely amazing. You really are one of the strongest woman I know, even when you say youdon't feel that way, it's still the sense I get everytime I check in on your blog!Thank you once again for sharing your story and your family with us! My mother and I had a conversation a few days ago (about the tragic death of my 23 year old sister, and not so tragic, but still painful death of my father at 72) and something she said resonates. "God answers all of our prayers, it's just that sometimes he says no". We can't understand why, but we are not meant to. I hope you get the news you want to hear tomorrow, and I hope you find peace quickly if you don't. Sending prayers for you and your family. This is tough. It didn't show up that I was pregnant with this baby until I the exact day that my period was due, which was on day 30. I bought test after test. I knew that I was pregnant, I wanted to be. But it took forever to show up. The tests kept coming back not pregnant, and I was. So stop testing for now. Wait and see what happens. I wish that I was there to hug you right now. ((HUGS)) I am always hear to listen. My prayers are with tonight. I'll give my own daughters an extra kiss goodnight, as we are sending you love from Minnesota. May you find peace. Wishing you lots of love & peace. I am so sorry that there are those who are making this time harder for you. Kate, I read your blog frequently because you are so open and honest about your feelings. I've never commented before but I feel the need to do so now. You are an amazing mother and you help so many people just through writing this blog. Just know everyone who reads your blog is pulling for you and keeping you in our prayers. I'm so sorry you've been having such a hard time. Thinking of you, hoping, and sending you prayers for peace & comfort. Just passing on a mental hug and letting you know I've been keeping you in my prayers! Hoping for a shocking + test tomorrow and for you to feel peaceful with the results either way. *HUGS* Kate. I'm so sorry you are feeling this way. I am praying for a positive outcome (and a positive test!). You are in my thoughts and prayers during this time. I've never posted before. I found your blog through "I love that Max". But I've been reading for a few months. I'm so sorry people have choosen to take the opportunity of your most vulnerable time to be cruel to you. I wish I had words of wisdom for you. Something to give you peace and encouragement but that can only come from God. No matter His will here, you are still His child and He still loves you. You are a loving mom and certainly no failure. Be gentle with yourself right now. Lean into those who love you. Prayers for you always. I am writing you to urge you to stop beating yourself up. I really don't think that your emotional state could impact whether or not the procedure is successful. This is not in your control, for better or worse. I would like to know if "estrogen high" is a medical term backed up by scientific evidence or the musings of a male doctor? If anyone should be berating themselves it's a doctor who would say anything to shake a woman's confidence and judgment. You didn't do anything wrong! Woman experience the full range of human emotions during pregnancy and still deliver healthy babies. You are human and you feel and it's OK. So weird to look back at this knowing that God did answer those prayers for another baby but in an unimaginable way. The things that have transpired since this writing have been so tragic yet so beautiful can't believe your little girl will be one.